Suraya Dadoo, a Rhodes graduate and researcher at the Media Review Network, was also in town as part of a countrywide campaign. 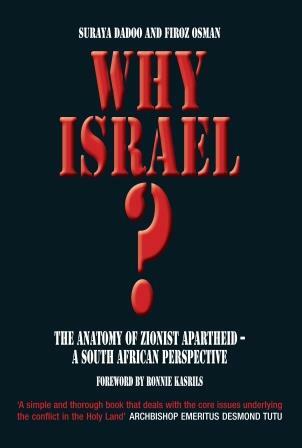 Yesterday, Dadoo launched a book titled Why Israel? The Anatomy of Zionist Apartheid – A South African Perspective at the South End Museum. The 13-chapter piece, which Dadoo co-wrote with Firoz Osman, unpacks the nuances underlying the decades-long conflict between Israel and Palestine, she says. The book, which has garnered praise from prominent human rights proponents including Archbishop Emeritus Desmond Tutu and Ahmed Kathrada, is not only written in plain language but also traces the root causes of the drawn-out Israeli-Palestinian tensions. “I’ve read many great books about the Israeli-Palestinian conflict. But most of them are written in inaccessible language. This book starts from the beginning and charts all the major issues that have arisen over the years,” Dadoo said. However, she is quick to point out that the campaign against what she and others term “apartheid Israel” is not about religion. “This is a human rights issue. This campaign cuts across race, religion and politics. “Also, this is not about anti-Semitism – it is taking a stand against segregation and state-sponsored discrimination,” she said. Many fought against the apartheid state and lobbied for boycotts, divestment and sanctions, the result of which was a free and democratic South African state. “Apartheid fell as a result of these efforts – we are advocating the same with Israel,” Dadoo said.